Warren Buffett loves these two top-quality companies with attractive dividend yields. Coca-Cola CEO Muhtar Kent, left, and Warren Buffett. Image source: Coca-Cola. Warren Buffett is one of the most successful investors in business history. The Oracle of Omaha has built his massive fortune by investing in top-quality companies and holding them for the long term. His simple approach means Buffett's investment strategy isn't too hard for individual investors to replicate, so it makes sense to look through the primary holdings at his company, Berkshire Hathaway (NYSE:BRK-A) (NYSE:BRK-B), to find investment alternatives for your own portfolio. Coca-Cola (NYSE:KO) and Wells Fargo (NYSE:WFC) are two remarkably different companies. They operate in their own industries and with their own weaknesses and strengths. Nevertheless, the two companies, both among Buffett's favorites, manage to reward investors with solid dividends. Coca-Cola is one of the most iconic Buffett stocks. The Oracle started investing in the company in 1988, and he's never sold a share. As of December, Berkshire Hathaway owned 400 million shares of Coca-Cola, representing 9.3% of the company's shares, for a current market value of around $18.75 billion. Buffett is a big fan of companies with superior competitive strengths, and Coca-Cola is second to none in brand differentiation in the soft-drinks market. The company owns an amazing portfolio, featuring 20 brands that make more than $1 billion each in global sales. That list includes iconic soft-drink names such as Coke, Diet Coke, and Sprite, in combination with healthier alternatives such as Dasani, Fuze Tea, and Powerade. We've never sold a share of Coca-Cola stock, and I wouldn't think of selling a share. I'm the kind of guy who likes to bet on sure things. No business has ever failed with happy customers. ... And you're selling happiness. Consumers around the world are increasingly inclined toward healthier nutrition, and this is hurting soda sales. According to estimates from Euromonitor, per-capita consumption of bottled water is on track to surpass soda sales for the first time ever in the U.S. during 2016. This is a valid reason for concern among investors in Coca-Cola, however, the company is proving to be strong enough to adapt to changing consumer demand. Total sales volume during the fourth quarter of 2015 increased 3%, with soda volume growing 2% and still drinks sales volume increasing by 6% versus the same quarter in the prior year. Coca-Cola is compensating for the sluggish demand in traditional sodas with vigorous sales in healthier product categories, so chances are that the company will continue thriving in a healthy new world. And Coca-Cola has an incredible track record of dividend payments over the years. The company has paid a quarterly dividend since 1920, and it's increased those payments for 54 years in a row. At current prices, Coca-Cola stock is paying a decent dividend yield of 3%. Wells Fargo is Buffett's favorite bank, and also one of Berkshire Hathaway's biggest holdings. The Oracle started investing in Wells Fargo in 1989, and he has consistently added to the position over the years. Berkshire Hathaway bought more Wells Fargo stock in the fourth quarter of 2015, and it now owns 9.8% of the company's shares, about 500 million shares, for a current market value of nearly $23.5 billion. Because banks operate with high degrees of leverage, a small fluctuation in the value of assets can have a huge impact on the value of shareholder equity. As a result of this particular characteristic in the banking industry, Buffett would consider investing in a bank only when the management team is top-notch, guaranteeing that assets will be managed in a sound and intelligent way. Because leverage of 20:1 magnifies the effects of managerial strengths and weaknesses, we have no interest in purchasing shares of a poorly managed bank at a "cheap" price. Instead, our only interest is in buying into well-managed banks at fair prices. ... With Wells Fargo, we think we have obtained the best managers in the business. Superior risk-management policies have allowed Wells Fargo to emerge from the financial crisis after 2009 in a much stronger shape than most of its competitors. 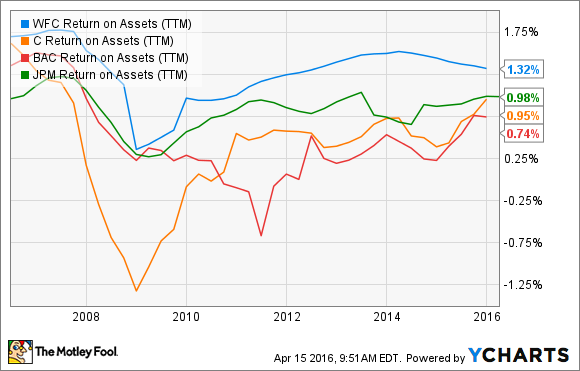 The following chart compares return on assets for Wells Fargo versus competitors Citigroup (NYSE:C), Bank of America (NYSE:BAC), and JPMorgan (NYSE:JPM) over the last several years. Wells Fargo did much better than the competition during the crisis, and the company is still materially more profitable than its peers. The company was able to focus on growth and expansion while the competition was too busy with financial and legal damage control. This shows how a high-quality management team can have a major impact on shareholder returns in the banking business. Wells Fargo still had to cut dividends in 2009, but the company has rapidly compensated investors since then with growing dividends. What was a quarterly payment of $0.05 in 2010 is now $0.375 quarterly, giving Wells Fargo stock a dividend yield of 3.2% at current prices. Investors should never blindly replicate the investment positions of others, not even an investing superstar such as Warren Buffett. However, there is nothing wrong with looking among Buffett's stocks for investment ideas as long as you are committed to doing your own research before buying. In that spirit, Coca-Cola and Wells Fargo are both high-quality businesses with solid competitive strengths, world-class management teams, and generous dividend policies. If they are good enough for Warren Buffett, maybe these companies deserve some consideration for your own portfolio, too.